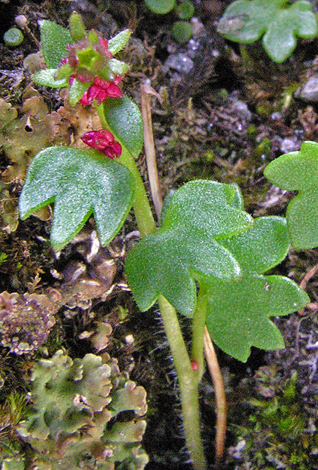 Saxifraga cernua is an Arctic alpine. It is found all over the Arctic islands in Canada for instance but here in the UK it survives at the tops of a very few of our highest Scottish mountains where short summers and long arctic-like winters still prevail. The common names in the English speaking world for this plant include Drooping Saxifrage, Bulbil Saxifrage and Nodding Saxifrage. While most of the interesting and attractive species for which Ben Lawers is famous grow in the Corries well below the summit, Saxifraga cernua survives in a few rocky crevices on the top of the mountain. Not only is this small plant very difficult to find, it is quite a slog to climb round Beinn Ghlas, up to the saddle between the two Munros and, having seen the many wonderful plants there, then to ascend to the rocky crags at the very top. On this occasion though we not only found Saxifraga cernua (this time none had terminal flowers, only bulbils) but saw a family of five Ptarmigan and a mountain hare all running off in haste at the heavy footfalls of one elderly, out-of-condition botanist. Last year I failed to find the small crevice in which S. cernua usually grows, but this year in bright, hot sunshine my sharp eyed colleague David walked straight to it. We immediately recognised the pale green leaves and distinctive red bulbils of one of our rarest saxifrages. It was encouraging to see many young plants in the immediate vicinity of the few with bulbils but this is clearly a threatened species as warmer summers become more common and average temperatures rise. The leaves of this plant are often described as "kidney shaped" - either some botanist authors never climb mountains or perhaps they should revise their knowledge of human anatomy. The rare Draba norvegica (Rock Whitlowgrass) was in the same crevice as the Saxifraga cernua and as another bonus, a Mountain Ringlet (Eribia epiphron) butterfly settled at the summit long enough for me to take a photo. 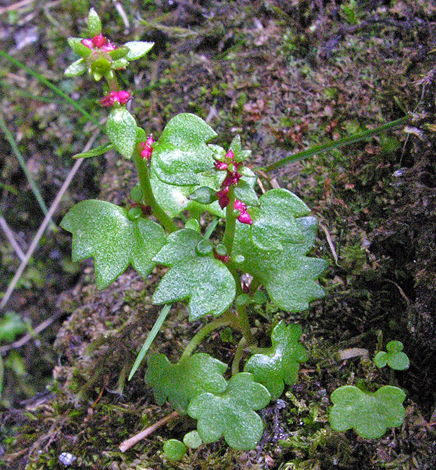 Saxifraga cernua is found on just five mountain tops in the Britihs Isles including this one at Ben Lawers, Ben Nevis and on the mountains by Glen Coe. It is absent from England, Wales and Ireland.